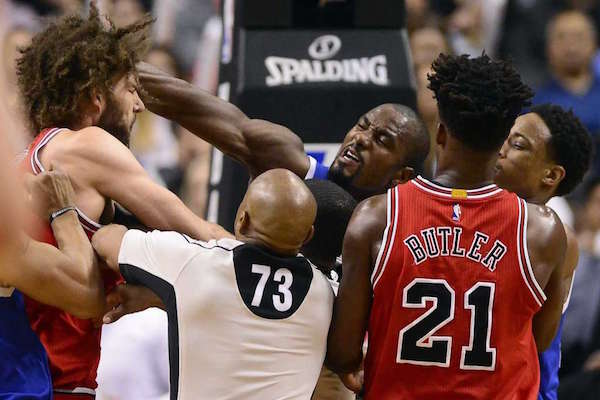 Serge Ibaka and Robin Lopez got into it during the Toronto Raptors’ Tuesday night overtime victory against the Chicago Bulls. The scene was so contentious, suspensions have to be coming. Lopez: "I'm expecting to be suspended." Butler on Lopez: "Obviously, he's going to be suspended. We know that." Suspensions could end up playing a pivotal part in shaping the playoff race. Or, you know, maybe not. The Bulls are now 10th in the Eastern Conference, two games behind the eighth-place Miami Heat, with the Detroit Pistons in front of them. They seem done, with or without Lopez. The Raptors, meanwhile, seem locked into the four-seed. They have a 4.5 game-lead over the fifth-place Atlanta Hawks, and while the third-place Washington Wizards are just a half-game in front of them, getting that three-seed always felt like a tall order without Kyle Lowry in the lineup. Ibaka’s absence, however brief, would throw a wrench in that pursuit. But, with the season series between Toronto and Chicago now over, that’s the extent of the long-term impact this scuffle will have.